NMM 14380. 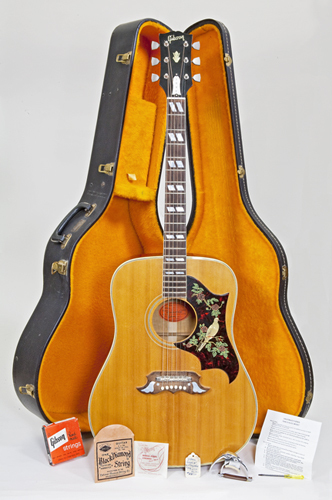 Guitar by Gibson, Inc., Kalamazoo, Michigan, 1964. Dove Natural. 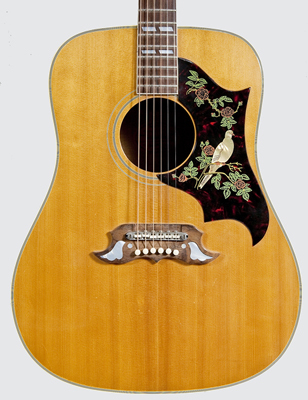 Serial number 224539. Purchase funds gift of André P. Larson in honor of his wife, Kay Marcum Larson, 2009. 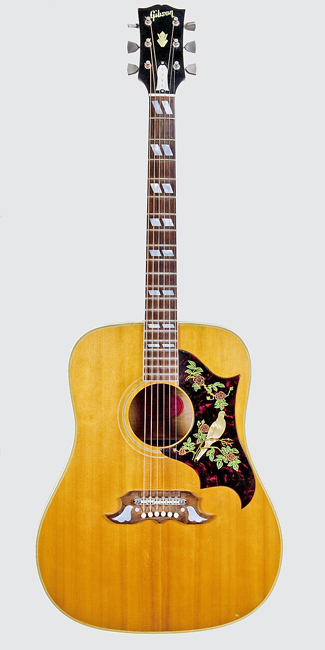 Gibson introduced the Dove in 1962 as their fanciest dreadnought, following the square-shouldered pattern that originated with the Hummingbird model in 1960s. While Gibson’s other dreadnoughts featured bodies made from rosewood and mahogany, the Dove was constructed from flamed maple, like the J-200, the most expensive flat top the company offered. This choice of wood contributes to a slightly brighter tone quality than is traditional for dreadnought models, especially those of Gibson. 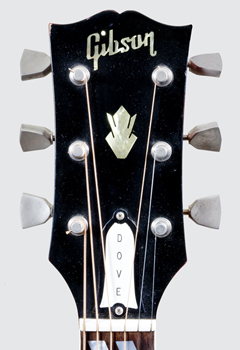 The Dove was made with tops in natural and sunburst finishes, the former for a higher cost. The model is named for the mother-of-pearl dove inlay in both the pickguard and the bridge, characteristic of the flashier aesthetic Gibson adopted for its higher-end flattops under the influence of country stars beginning in the late 1930s. Elvis Presley performed on sunburst Gibson Doves in the 1970s— throughout much of his late career in Las Vegas. 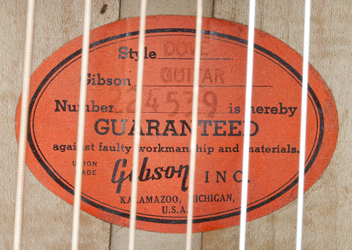 Inscriptions: Printed on orange, oval paper label with double-line border, the outer line bold: Style DOVE ["DOVE" rubber-stamped in purple ink] / Gibson GUITAR ["GUITAR" rubber-stamped in purple ink] / Number 224539 ["224539" rubber-stamped in purple ink] is hereby / GUARANTEED / against faulty workmanship and materials. / UNION / MADE Gibson INC. / KALAMAZOO, MICHIGAN. / U.S.A. 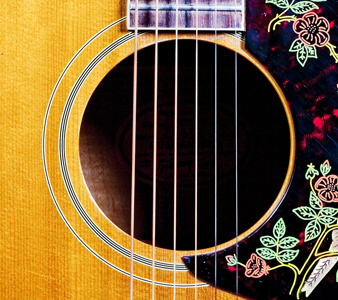 Body: Soundboard: two-piece spruce: medium, slightly wavy grain. 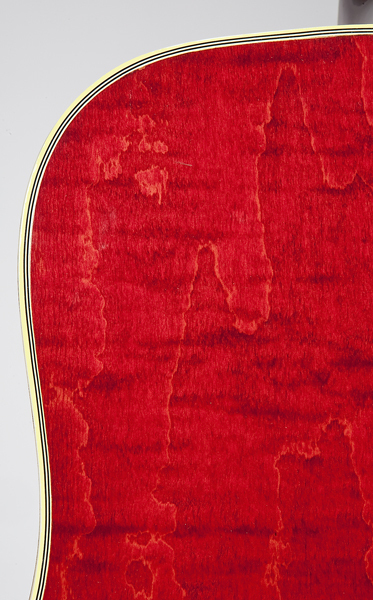 Back: one-piece, slab-cut maple: narrow, horizontal curl; no back stripe. Ribs: one-piece, slab-cut maple: faint, narrow, horizontal curl; no end graft. 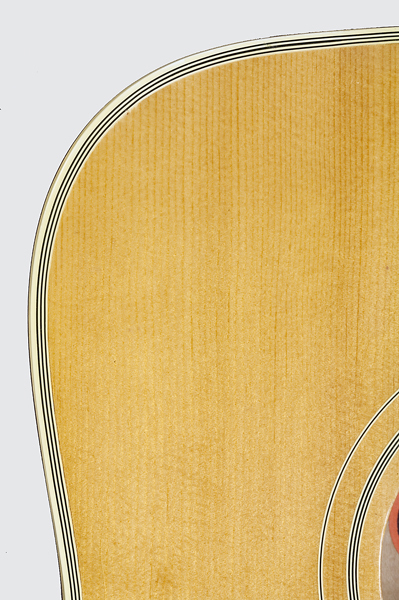 Inlay: Binding: white celluloid; top trim comprised of six-ply, black-white-black-white-black-white celluloid purfling strips; back trim comprised of four-ply, black-white-black-white celluloid purfling strips. Back stripe: none. End graft: none. 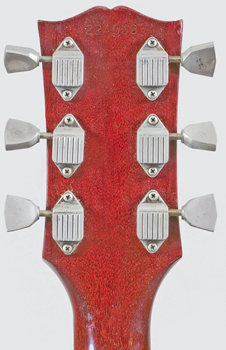 Trim: Finish: clear lacquer with some checking on top; removed from binding; red lacquer on back, sides, neck, and head. Endpin: aluminum; nickel-plated steel Phillips-head screw through center. 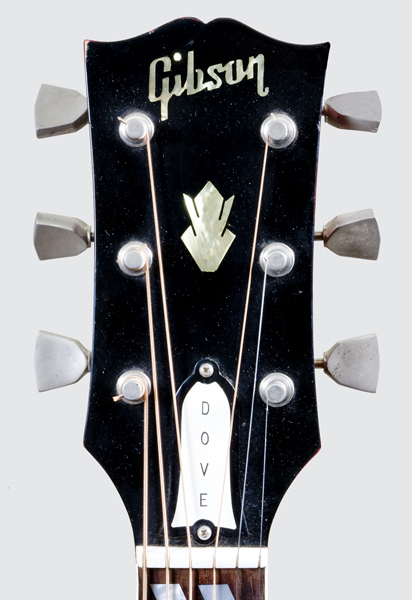 Head: mahogany stained black on face; inlaid with mother-of-pearl geometric decorative device; white-over-black, bell-shaped truss rod cover with black border, the word DOVE engraved in descending letters, secured with steel, Phillips-head screws. Neck: mahogany; integral with head. 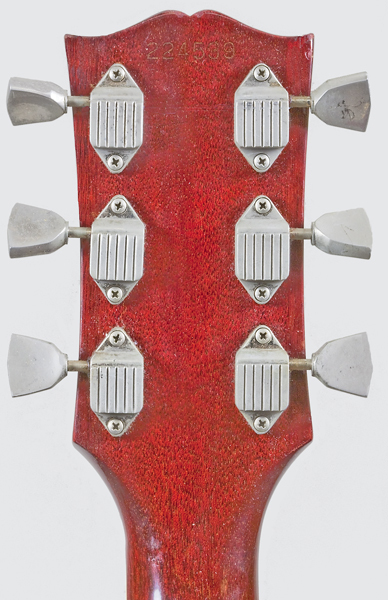 Tuners: six, nickel-silver or nickel-plated worm-gear machine tuners with tulip-shaped, nickel-silver or nickel-plated heads and worm-gear mechanisms enclosed in rectangular covers. 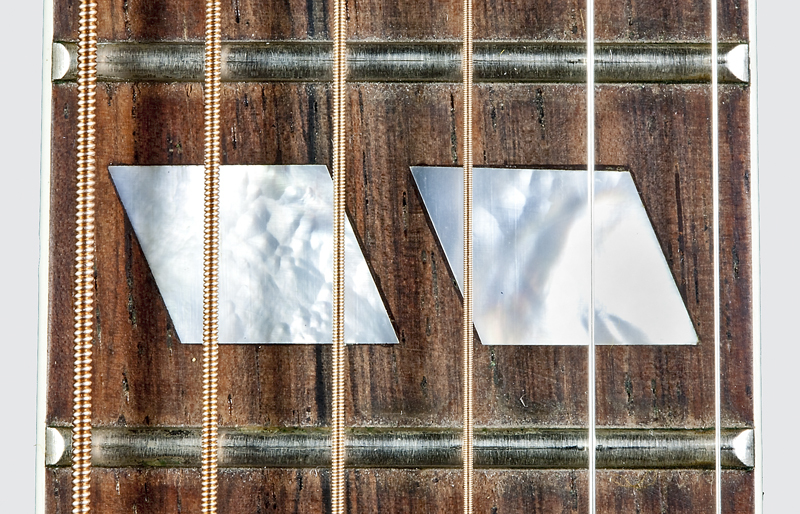 Fingerboard: rosewood bound in white celluloid; 20 nickel-silver frets; mother-of-pearl, split parallelogram inlays behind 1st, 3rd, 5th, 7th, 9th, 12th, 15th, and 17th frets; single, imitation-tortoise-shell, celluloid side dots behind 1st, 3rd, 5th, 9th, 15th, and 17th frets; double, imitation-tortoise-shell, celluloid dots behind 7th and 12th frets. Nut: white plastic. Heel cap: none; neck heel flush with back. Rosette: wide band of white and black striped celluloid (7 strips—white on outside) set in from inside edge, surrounded on outside with narrower band of white-black-white celluloid with natural wood in between. 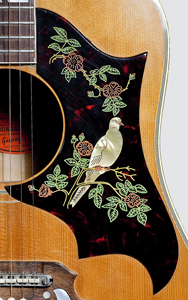 Bridge: rosewood with decoratively cut outline; inlaid mother-of-pearl doves on each side of bridge pins; nickel-plated, steel mechanism (Tune-O-Matic) with individually adjustable, angled, white plastic saddles, fastened to bridge with two, slot-headed steel screws; ivory plastic bridge pins; single mother-of-pearl dots on each side of bridge pins. 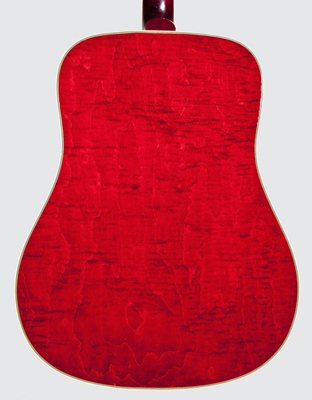 Linings: kerfed mahogany. 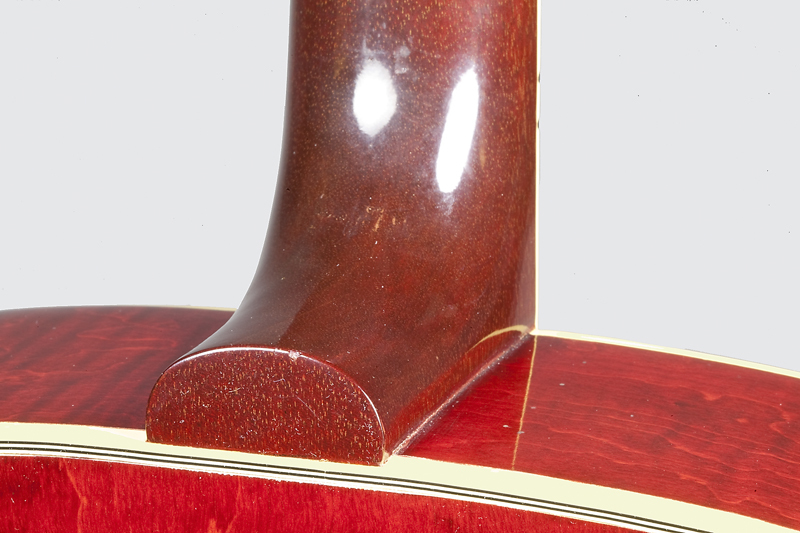 Neck block: mahogany; chamfered corners. End block: mahogany. Top bracing: spruce X-brace, the joint of main cross brace reinforced with white cloth, small spruce blocks glued to inside of top on upper and lower side of X at joint; spruce lateral brace above soundhole; two spruce transverse braces in lower bout; maple bridge plate screwed to bridge. Back braces: four spruce back braces. Back graft: maple back graft does not extend to endblock.